One of the most well known Irish genealogical sources in the U.S. is the Boston Pilot series of information wanted ads. Despite its widely known status, it is always worth clearly explaining a record set in detail and highlighting the fact that there were other newspapers that also carried such ads. 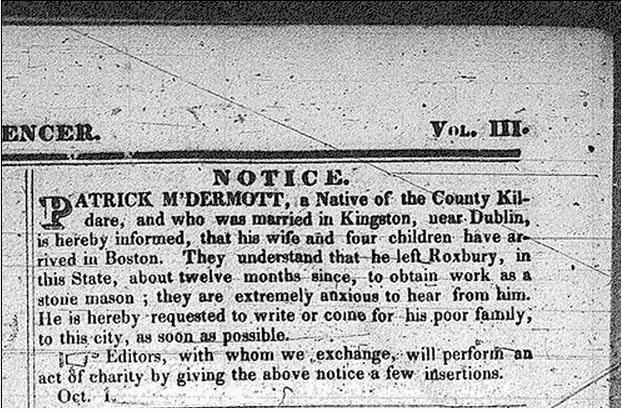 In the 19th and 20th centuries, Irish people in the U.S. and Ireland who were looking for information about immigrant family members placed information wanted adverts in newspapers. These adverts requested information about the immigrant who had not been heard from for a period of time, usually a few years. "During this time, formal communication was by the written word, but an international postal system was just emerging, making it difficult for those who had immigrated to keep in touch with those they had left behind. The result was that many of those in Ireland had no idea where their relatives and friends might be. Many new Irish Americans simply became “lost” to those who cared for them." The first ad appeared in the Boston Pilot in October 1831. The wife of Patrick McDermott placed the ad looking for him as she and their children would be returned to Ireland if he was not located. The ad outlined that he was from County Kildare and provided more information such as where he was born and details about his first year in the U.S. (see image below). From 1831 to 1920, over 45,000 ads were placed in the paper and they provided an abundance of information about those who were sought after. Standard information included name, place of origin in Ireland (often including civil parish and townland), name and details of person seeking information, and the relationship between them and the missing person. Other information that was regularly included told of the ship the immigrant traveled on, year of arrival, locations in the U.S. after arrival, occupations, and work history. As more Irish immigrants came to the U.S., they inhabited more and more states. As a result the ads sought information about people in states up and down the east coast, the mid-west, and Canada. Therefore, it is easy to see how these ads have become probably the most well known Irish genealogy source in the U.S. The Boston College Information Wanted site has transcriptions of the ads for the years 1831-1878, 1880-1882, 1887, 1889, 1890, 1893, 1901, and 1913. It is free to access and has 41,249 records. Ancestry.com has "Searching for Missing Friends: Irish Immigrant Advertisements Placed in "The Boston Pilot 1831-1920". The database contains indexed images. Americanancestors.org. Searching for Missing Friends: Irish Immigrant Advertisements [database online]. Boston, MA: Americanancestors.org. 2010. Harris, Ruth-Ann M., Donald M. Jacobs, and B. Emer O’Keeffe, editors. Searching for Missing Friends: Irish Immigrant Advertisements Placed in “The Boston Pilot 1831–1920”. Boston: New England Historic Genealogical Society. 1989. 8 vols. Note: information in the Ancestry.com and Americanancestors.org databases comes from this publication. One has to wonder how many of the missing people were reunited with their friends and family members. Some of the ads outlined how a person was not heard from for ten years or more. It would be remarkable to think they ever made contact again. Something to remember as we use these ads for our research. Check out the next blog post in a few days which will highlighted information wanted ads from another east coast city. Harris, Ruth-Ann and Kathleen Williams. Information Wanted - History. 2014. http://infowanted.bc.edu/history: accessed 9 September 2014. The biggest Irish genealogy fair of the year, Back To Our Past (BTOP), is on in Dublin next month over three days - Friday, October 17th to Sunday, October 19th. BTOP has been running for a number of years and is always a very well attended event. A central part of BTOP is the talks that expert speakers give. This year there are four that wil be interest to those with emigrant Irish ancestors. Famine emigration from south Wicklow - two sides of the same coin by Jim Rees** (author). Presentation Area 2, 2:30pm. You can get the full list of talks by clicking here. ** I have previous written a post about Jim Rees' work in relation to assisted emigration from Wicklow. Click here to read. The state of Maryland has had a long association with Catholicism. In receiving a grant of charter for a Maryland colony, Cecilius Calvert, 2nd Baron Baltimore in the 17th century, aimed to create a new colony that was to be a haven in America for Catholics. The first diocese in America was created as the Diocese of Baltimore in 1789. It is interesting to consider that this Catholic heritage is a possible factor for the unusual circumstance, when compared to other state archives, that the Maryland State Archives has a considerable collection of Catholic Church records and parish registers. The reality though, is probably more to do with good foresight, as the introduction to the Maryland Religious Records special collections reads: since systematic recording of vital records was not established until 1875 for Baltimore City and 1898 for Maryland counties, religious records are often the only source for birth and death information. The best place to start is the Guide to Catholic Church Records webpage on the State Archives' website. 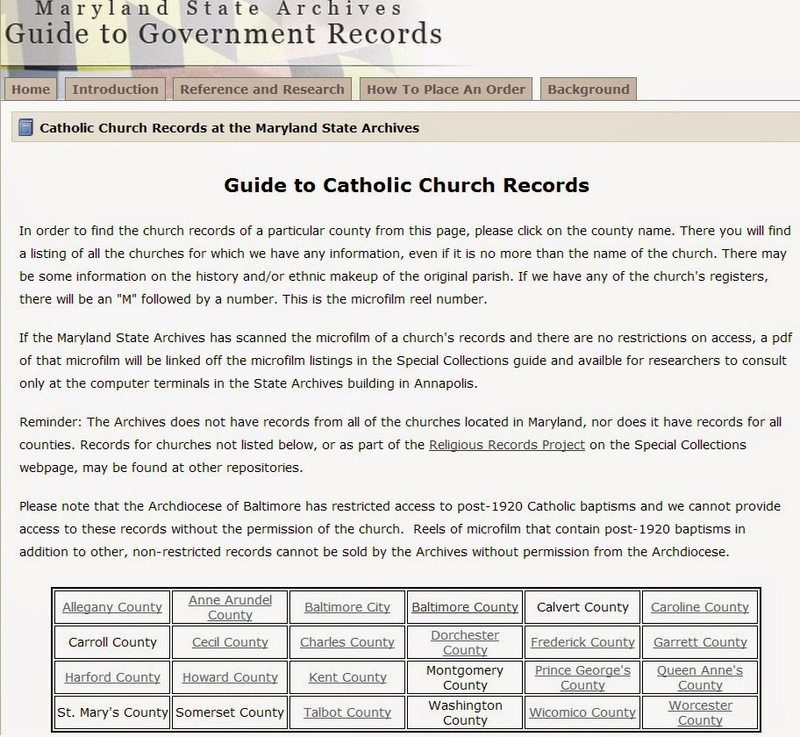 This guide helpfully divides all their Catholic Church records by county. Most counties in the state are represented in this guide. Basic, but useful notes are provided for the majority of entries. For example: St. Patrick's, Cumberland [Allegany County]: Established in 1790, it originally served the entire county. Many of the early parishioners were Irish immigrants, who came to America to work on canal projects. Extensive detail is given about the parishes in the city of Baltimore. The guide divides this information into four time periods between 1750 and 1950. This is due to the changing boundaries of the city and different parish boundaries before 1884. Where known, parish ethnicity is noted as immigrants worshiped at a parish of ethnicity (e.g. Irish, Polish, Italian) as opposed to their nearest parish church. For some parishes, you can consult parish register transcriptions in pdf format at the State Archives building. You can visit the Maryland State Archives in Annapolis, the state capital. McSherry, James. History of Maryland from Its First Settlement in 1634 to the Year 1848. Baltimore: John Murphy. 1849. pp. 22-25. Maryland State Archives. Guide to Special Collections. 2014. Available online at http://speccol.mdarchives.state.md.us/pages/churches/history.aspx: accessed 27 August 2014. Maryland State Archives. Guide to Catholic Church Records. 2008. Available online at http://guide.mdsa.net/viewer.cfm?page=catholicchurchrecords: accessed 27 August 2014. Read the first parts of this series by clicking part 1, part 2 & part 3, or scroll down if on the homepage. Beginning February 1756, information from newspapers about ships that sailed to North America is available to consult in the IED. The vast majority of entries are made up of transcriptions of short articles that focus on the journey of the ship. Information usually includes the name of the ship, port of embarkation, and where the ship is going to/port of arrival. The date of departure can be worked out from the date of the newspaper article. Lengthier articles usually mean that something out of the ordinary happened, such as the ship getting into difficulty at sea. If you have been able to find the ship on which you Irish ancestor(s) arrived in North America, then you might be able to find more information from a simple name search for the ship. For example, this article discuses those about to embark on the Charles Kerr in 1838. The ship left from Limerick port and the majority of passenger were from County Clare. The vast majority of passenger lists from before 1892 for those traveling to North America do not give a place of origin beyond, say, Ireland. Searching for the name of your ancestors ship in the IED is one tool that can be used to potentially solve this problem. DIPPAM. Emigrants from Clare, Limerick and Tipperary. http://www.dippam.ac.uk/ied/records/28216: accessed 20 August 2014. Document ID 9310379. Originally from The Belfast News Letter, August 24th, 1838. Labels: Assisted Emigration, Belfast, Canada, Clare, Immigration, Limerick, Migration, Place of Origin, U.S.A.
Read part one of this series by clicking here, or scroll down if on the homepage. Examples of Irish place of origin information can be found in many types of documents on the IED, across the 18th and 19th centuries. As all the information in the IED has been transcribed, a researcher can quickly enter the names and places that are of interest to their research. Many of the transcriptions contain a modern fixed spelling of a word in parenthesis beside the original, or a full spelling of an abbreviation, for example Pensylvania [Pennsylvania?] and Anthony McClean, near Letter Kenny,[Letterkenny,?] Co. Don.[Donegal?]. This can help with searching the database, but as with all transcribed records, caution should be taken and, if possible, the original viewed to get all possible information from the document. Three examples, from across the centuries show the potential in this database. Firstly, this newspaper article from 1762 discusses the findings of a group of men who inspected land in Nova Scotia, Canada. Seventeen Irish immigrants are listed, along with where they are from in Donegal, Antrim, and Derry/Londonderry.Another example is the reporting of deaths of Irish emigrants, of which there are hundreds. In this short notice, the death of a Fermanagh man in Canada in 1835 is reported in the local newspaper in Ireland. Lastly, 1897 probate information for a Tipperary woman who died in California mentions where she came from in the county and the name of her sister. DIPPAM. Declaration of Committee of Immigrants to Nova Scotia. http://www.dippam.ac.uk/ied/records/28069: accessed 20 August 2014. Document ID 305015. Originally from The Belfast Newsletter, 11 March, 1762. DIPPAM. Death notice of Michael Graham, Monaghan, Upper Canada. http://www.dippam.ac.uk/ied/records/51766: accessed 20 August 2014. Document ID 9408370. Originally from The Enniskillen Chronicle, Thursday, November 5, 1835. DIPPAM. Estate and Effects of Mary Treacy. http://www.dippam.ac.uk/ied/records/53220: accessed 20 August 2014. Document ID 9410121. Originally from Estate and Effects of Mary Treacy at Public Records Office of Northern Ireland. Labels: Antrim, Assisted Emigration, Belfast, Canada, Derry, Donegal, Fermanagh, Immigration, Place of Origin, Tipperary, U.S.A.
On Saturday, September 20th, I will be visiting the Irish Family History Forum to give two talks: Finding Your Irish Ancestors in New York City and Advanced Irish Genealogy: Delving Further into Irish Sources. When I first moved to the U.S. in 2010, I was delighted to find such a large and active Irish genealogy group near New York City. Before relocating, I always tried to make it out to their monthly meetings to hear their expert speaker, share some Irish genealogy news, and learn some piece of info about the Irish in America. If you can't make that date, I'll be back in the New York area in October. On Saturday the 18th, I'll be speaking at the Genealogy Event. This is on at the National Archives and Records Administration, Bowling Green, Manhattan. It's a three day event, beginning on the Friday. My talk is one of the advanced sessions and is on in Meeting Room 1, from 11:00am to 12:30pm. Irish genealogy has a reputation for being difficult. When a researcher begins to grapple with sources in Ireland, they focus on census, vital (birth, marriage, death), parish register, tax, and criminal/legal records. But what is available when these sources have been exhausted? Are there other records to conducted research in or did the infamous Civil War explosion and fire in 1922 take care of all that? This advance Irish genealogy talk will outline what other records are available and where you can find them, both online and in an archive. If you have not heard about the Reproductive Loan Funds, Canceled Land Books, Chief Secretary's Office Registered Papers, or George Bassett's county directories, then this talk is for you. The millions of Irish who came to New York in the 19th century did not make it easy for their descendants to find where they came from in Ireland. If you have already combed through federal and state census records, searched the birth, marriage and death certificates, written away for Church records, and scrutinized the city directories, then this talk is for you. The talk will firstly cover a number of strategies for tracing Irish ancestors in and around the city. The importance of having a knowledge of social and economic conditions in Ireland before an emigrant left will be discussed. Underutilized record sets that could yield a relevant name, location in Ireland, or pertinent genealogical information will also be outlined. The last section of the talk will be given over to something crucial to all those with Irish ancestors: the numerous record sets and publications that definitively give an Irish place of origin. Saturday, 20 September: Finding Your Irish Ancestors in New York City AND Advanced Irish Genealogy: Delving Further into Irish Sources. Hosted by Irish Family History Forum. Venue: Bethpage Library, 47 Powell Ave., Bethpage, NY 11714, USA. 10:00am - 12:30pm. Free, no booking required. Saturday, 18 October: Finding Your Irish Ancestors in New York City. The Genealogy Event. Venue: NARA, Alexander Hamilton US Custom House, 1 Bowling Green, New York, NY 10004, USA. 11:00am - 12:30pm. Ticket Purchase required. In a series of posts over the coming weeks, I am going to focus on a part of the DIPPAM (Documenting Ireland: People, Parliament, and Migration) project at Queens University, Belfast. 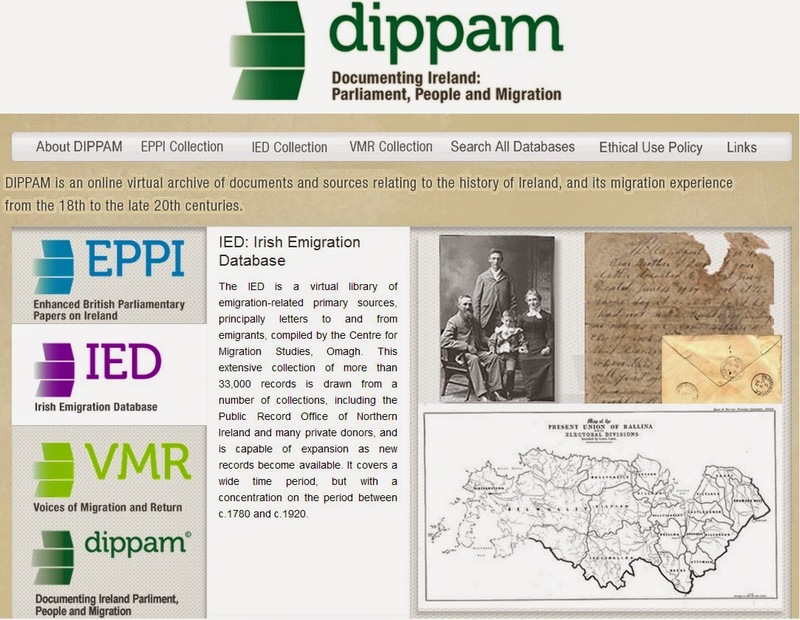 DIPPAM is "an online virtual archive of documents and sources relating to the history of Ireland, and its migration experience from the late 18th to the 20th centuries." It currently consists of three collections: Enhanced British Parliamentary Papers on Ireland (EPPI), the Irish Emigration Database (IED), and Voices of Migration and Return (VMR). The IED will be the focus of these posts. At the time of writing, there are currently in excess of 33,000 documents in the IED and they can be divided into three broad categories. Documents created by private individuals (e.g. letters, diaries, and journals written by migrants), newspaper material, and official/government papers made up of reports, statistics, and parliamentary debates, all concerning emigration. Documents in the IED cover the period 1700-1950, with three quarters of the information in the database from the 1820 to 1920 period. Materials from all thirty-two counties in Ireland, the U.S., and Canada are to be found in the database. Overall, the majority of sources supplied to the database creators concern the province of Ulster. So what kind of genealogical information can be gleaned from all these documents for those researching from this side of the Atlantic? My analysis of this database leads to the answer of Irish place of origin information, named relationships between emigrant and family members in Ireland, and information about ships on which emigrants traveled. I will outline examples of each of these three aspects between now and mid-September. Labels: Assisted Emigration, Belfast, Canada, Immigration, Place of Origin, U.S.A. In the 1820s, the British Parliament hatched an ambitious plan to survey the whole of Ireland. Along with the maps, memoirs were to be created which would be written descriptions to accompany the maps. The memoirs were to include information about such aspects as natural features of the land, modern and ancient topography, occupations, religion, emigration, and habits of the people. Sadly, the plan was not realized for the whole of Ireland. But the hoped for incredible level of detail was collected for the first two counties surveyed, Derry and Antrim. In particular, this included lists of people who emigrated, where they went to, and what townland they were from. A listing of emigrants from four (civil) parishes in County Derry is freely available on the Library and Archives Canada (LAC) website. Emigration Lists of Various County Londonderry Parishes was compiled by Dr. D.A. Chart from documents at the Royal Irish Academy in Dublin. He presented the document to LAC around 1935. In total it comprises 52 pages and lists hundreds of emigrants. Information includes: name of emigrant, year of emigration, port of arrival, age, religion, and townland of origin. 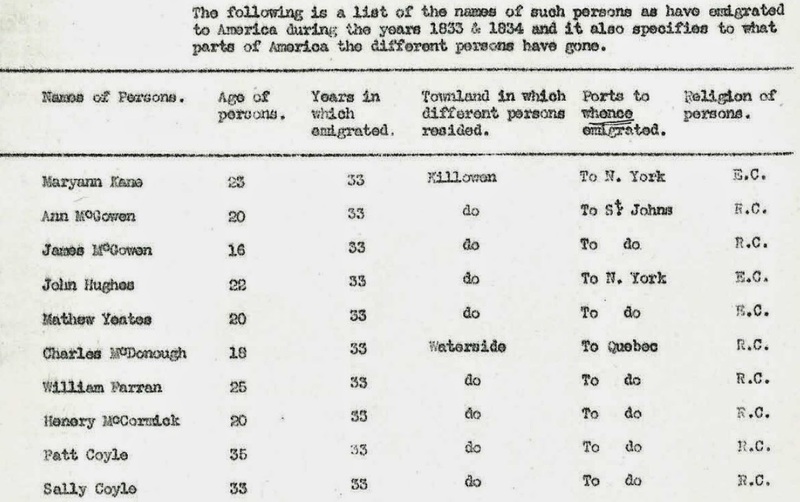 Emigrants are listed traveling to New York, Philadelphia, Baltimore, Quebec, and St. John's. Place such as Scotland, Liverpool, and Jamaica are also listed. It is a truly outstanding resource and is freely available in pdf format to consult and download. Access it here. The Ordnance Survey memoirs for various Irish counties are available to purchase on the Ulster Historical Foundation website. Brian Mitchell, a prominent Derry based genealogist, has published the listing of emigrants from both Derry and Antrim in his book, Irish Emigration Lists, 1833-1839.